Product #22010 | SKU SC-ENG/CF100D | 0.0 (no ratings yet) Thanks for your rating! The Secced SC-ENG/CF100D is a lightweight, sturdy, robust, 2-stage, carbon fibre video tripod with traditional structure (the top & middle sections have twin-tube design). It has a ø100 mm bowl and its feet are double-spiked. 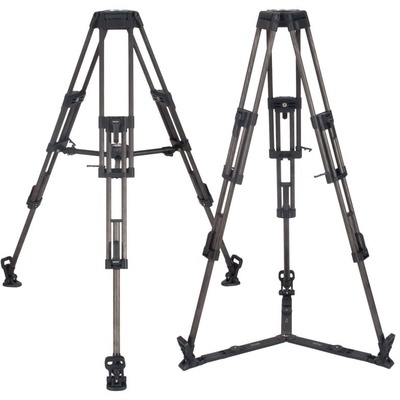 The payload of the tripod is 40 kg and has a maximal height of 78-155 cm – used with a ground spreader. Thanks to its carbon fiber construction the ENG-CF100D is extremely lightweight and has an outstanding torsion rigidity. The torsional rigidity is a measure of a body's resistance to twist. The high torsional rigidity is the most important characteristic of professional video tripods. It determinates how resistant the video tripod is to twisting mechanical influences during pan. The adequate torsional rigidity is essential at recording to achieve smooth camera movements. It is a strong, stable tripod that can be handled easily and installed in a few seconds. The ENG-CF100D is ideal in ENG situations, thanks to its light weight, fast and easy set-up and its compact transport size. The suitable Secced fluid heads are the V12/100AH and the V15/100AH, but it can be used with Secced and other manufacturers' similar heads with standard 100mm ball. Fluid heads with 75mm ball can be fitted to the ENG-CF100D with the optional TM-75/100 bowl adapter. In order to achieve maximum stability, the SC-ENG/CF100D can be equipped with different optional accessories which make it applicable for the most variable shooting situations. The compatible mid-level spreader SC-MS100AH has variable angle and it is telescopic, just like the floor spreader SC-FS100. The accessories can be mounted tightly and firmly to the tripod, increasing its rigidity.